Every SmartArt graphic treats bullets a little bit differently. Some SmartArt graphics allow bullets within a shape, others confine the bullets to a list outside of the shape, and other layouts don't allow bullets at all. The bullet command is grayed out for SmartArt layouts that don't allow bullets. If your layout doesn't allow bullets, choose another layout until you find a SmartArt layout that meets your needs. This topic discusses adding bullets to a SmartArt graphic. 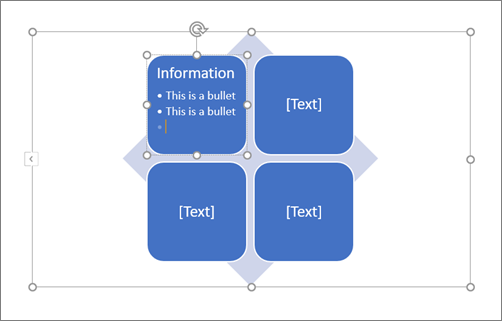 To add bullets to a document in Microsoft Office Excel 2007, Microsoft Office PowerPoint 2007, or Microsoft Office Word 2007, see Insert bullets in a worksheet, Add bullets or numbers to text, or Create a bulleted or numbered list. Click the shape in the SmartArt graphic you want to add bullets to. On the Design tab, click Add Bullet. If you don't see the SmartArt Tools, Design, and Format tabs, make sure that you selected the SmartArt graphic. The layout for the SmartArt graphic controls whether there are bullets in the shape. If the layout does not have bullets, choose a different layout if you want bullets to display in your SmartArt graphic. It is not possible to change the bullet style for text in a SmartArt graphic.